Soon after the floods of May 2010 hit middle Tennessee, ReTune Nashville was born and set out on a mission to provide relief to uninsured musicians who were affected by the Nashville flood through the sale of artwork created from flood damaged musical instruments. The flood-damaged guitar I chose to "retune" was donated by Joe Glaser and was in decent shape, considering. Joe is owner and operator of Glaser Instruments in Nashville and has done work with such artists as Keb Mo, Vince Gill, John Fogerty and others. Inspiration for my guitar came from the pure lyrics and voice of Eileen Rose while wildly playing her battered, acoustic guitar with The Legendary Rich Gilbert's steel guitar eerily crying. They're pure nostalgia in their look and sound. I wanted to capture that; along with the feel, sound and look of Lower Broad in downtown Nashville "reflecting" onto my ReTune guitar. After one of their shows on Lower Broad between 2:00 and 3:00am, Eileen and Rich graciously let me take reference photos of them for the painting. 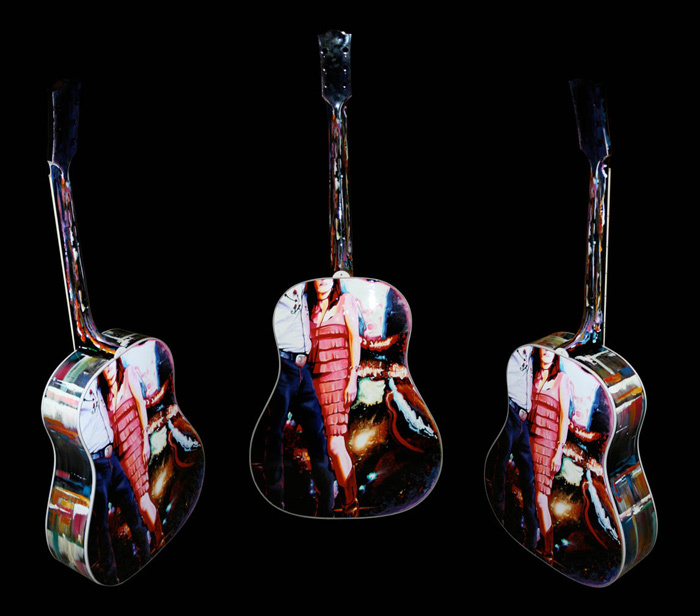 "No Strings Attached" features Eileen and Rich boldly painted in acrylic on the back (now front) of the guitar with painted "reflections" of Lower Broad blazing down the neck and sides.